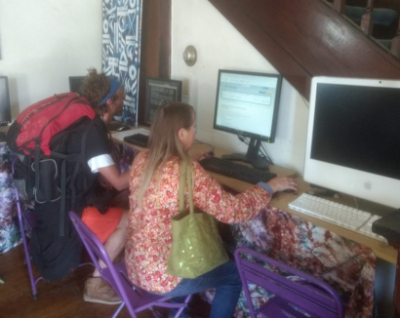 We are working on creating a space for our community to access technology and the internet, an open Internet Café. Often those on the margins have a tough time finding and applying for jobs, looking for housing, learning new skills, etc. since most publicly available resources have limitations on how and when you may use their computers. We will be hosting Coffee, Tea, & House Hunters project on TUESDAY 10am until 12pm & WEDNESDAY 12pm until 2pm. During this time, folks are welcome to use the internet for job searches, leisure use, and most importantly… House Hunting! Our newest project called House Hunters will be meeting during these times. There will be a member of our research/accompaniment team on site to assist folks in need of housing that are currently living outside or in shelters and have income. ***We are in need of VOLUNTEERS for research and accompaniment!! If you are interested please contact us for further details!